Aaron Shiret examines language teaching in our secondary schools. For many a generation, school students in the UK were obliged to study a foreign language – more often than not French – which provided a window into foreign cultures that they had comparatively little interaction with in the rest of their lives; nonetheless it was an enriching experience. Then just as the reality of globalisation was beginning to cement itself in the public conscience and the UK’s citizens were working and travelling abroad more than ever, in 2004 the government removed this obligation, leaving us with the perverse scenario of falling language study at a time when it is far more necessary than the days when language study was at its highest. Annual statistics just released by Cilt, the National Centre for Languages, show that only 38% of state schools have a majority of students taking a foreign language at GCSE level. This problem is mirrored in universities, where the numbers of students studying some languages, such as German, are declining. This is a major flaw in our education system and a missed opportunity, given the avenues available to people with another language, such as work and study abroad, or more exciting forms of work in this country. When compared to the language-skills bred in other countries in Europe, it is in fact something of a national embarrassment for the UK that it has a phobia of foreign languages. With business increasingly international, our economy needs highly qualified staff with good language skills more than ever, and yet the numbers of people wanting to study foreign languages is still decreasing. It is easy to argue that English is a global lingua franca, and that the high levels of English study in other countries make our studying of their languages redundant. But in a politically and economically integrated EU, and globalised world, for British business to flourish and subsequent relations with other cultures to expand, a large base of language speakers is required. Businesses or organisations trying to build relations abroad will encounter little success if they don’t even show enough interest in their prospective partners to bother employing someone who speaks the local language. While the level of English spoken by workers in the world’s largest tourist destinations is sufficient enough for business to be conducted there, this by no means reflects the global picture of English-speaking. Overall two-thirds of the world’s population don’t even speak English as a second language, and so a variety of other languages are going to be vital to Britain’s future relations. Ironically, given what I’ve just said, the declining numbers of language students has far less to do with perceptions of English’s omnipresence than it has to do with students feeling that they would rather take another subject they would perform better in. Languages are very difficult to master, and take years of commitment to get to a stage where you feel confident in your ability to communicate with native speakers. Compare that to other subjects that students can take at GCSE level, which are less dependent on a technical ability and more related to how hard you study, and it is easy to see why languages are shunned. The failure of our students to grasp languages may therefore also be in part to do with the quality of language teaching in the UK. Some students, like myself, have attended schools designated by the government as language colleges, accessed brilliant teaching and resources and so haven’t faced an uphill struggle to learn a language. The government’s initiative of specialist schools has therefore managed to pay some dividends in languages, but you are far more likely to feel this if you get to attend one of those schools. However the majority of pupils in this country attend schools where a large amount of focus is put on something else, such as science or arts, and will see their own school treat language teaching as a low priority. Ofsted recently reported that there was generally insufficient use of the target language by teachers in lessons, giving instructions in English, when this is a key part of the learning process. Furthermore they said that students aren’t being encouraged or helped to read widely a lot of the time. Thankfully these are both measures that can be worked on, and combined with some more exciting teaching methods, we may even see a resurgence in language study if a culture can be engendered that promotes the idea of languages being fun, and an investment in your future. 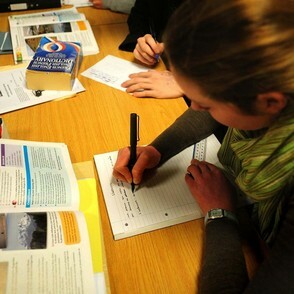 The inclusion of a foreign language in the requirements of the English Baccalaureate, the new standard of measuring a school’s GCSE performance, may well incentivise schools to make learning a language compulsory within their school and encourage headteachers to try and improve performance in this area. Time will tell whether the UK is prepared to step up to the plate; but doing so is going to be integral to its future relations. The unposed and unanswered question is: “Which language(s) should we be teaching in our schools?” I’d like to sdee Esperanto taught more widely. Esperanto belongs to no one nation or group of nations. I don’t know whether comments from 60-year-olds are wanted on this site, but I think that Ofsted’s criticism of teachers for giving explanations in English is misplaced. One of the reasons that pupils in schools don’t like languages is the preponderance of “communicative method”, whereby everything is supposed to be in the target language. If they can’t understand a point being illustrated, they become baffled, then bored, and then hostile to the whole idea of studying languages. Certainly most of the lesson should be in the target language, but the fanatical application of the “no-English” rule has been counter-productive.